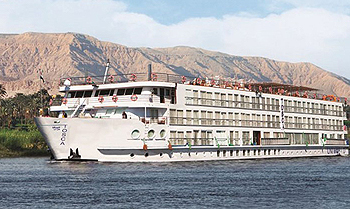 The intimate 82-passenger, all-suite River Tosca provides a relaxing and comfortable setting for guests as they cruise the legendary Nile River and explore its most wondrous cultural sites. The vessel features a stylishly adorned lounge with full-service bar, cozy library, restaurant, fitness room, massage room, and an expansive Sun Deck with shaded cabanas and a swimming pool, perfect for a refreshing dip. Facilities onboard the comfortable River Tosca include:All beautifully appointed suites feature a French balcony, and custom-made beds draped with the finest bed linens. Added conveniences include a vanity and make-up mirror, generous built-in closets, a hair dryer, safe, individual thermostat for air conditioning, direct-dial telephone, iPod docking station, and flat-screen television with satellite channels. Private bathrooms have both a bathtub and shower, and are stocked with thick towels, cozy robes, his and her slippers, and soothing bath amenities.